Rua 25 de Março is only 2.5 km long, but is the largest commercial center not only in São Paulo but Brazil. It has hundreds of stores, and a large number of stalls . Shoppers find an amazing variety of products, from clothing, footwear  and textiles , to toys , jewelry  and electronics. It has become known as 'Bargain Street' because of its low prices. 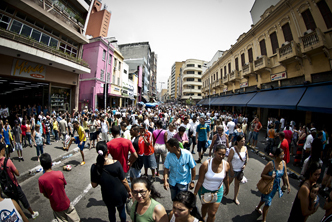 Every day nearly 400,000 people pass through Rua 25 de Março and its neighboring streets. In December, the region is a human ant nest , visited by up to a million people a day. About 60,000 people work in commerce in the region. 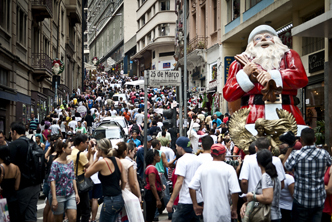 According to the Rua 25 de Março Store Owners Association, businesses there turned over  R$ 17 billion in 2011. Rua 25 de Março has the most expensive square meter in the country, with rent of some stores being over R$ 50,000 a month. Even genius composer Adoniran Barbosa (1910-1982) worked in a store in Rua 25 de Março, in the 1930s. He was not there for long. São Paulo's biggest samba star was fired  because he used to serve customers  while tapping on the counter. Rua 25 de Março is in the center of São Paulo city, and was opened in 1865. Matéria publicada na edição de número 76 da revista Maganews. 2 Rua 25 de Março (March 25th Street) – O texto mantém a versão original em português por se tratar de um nome próprio de uma rua que virou símbolo de consumo no Brasil.